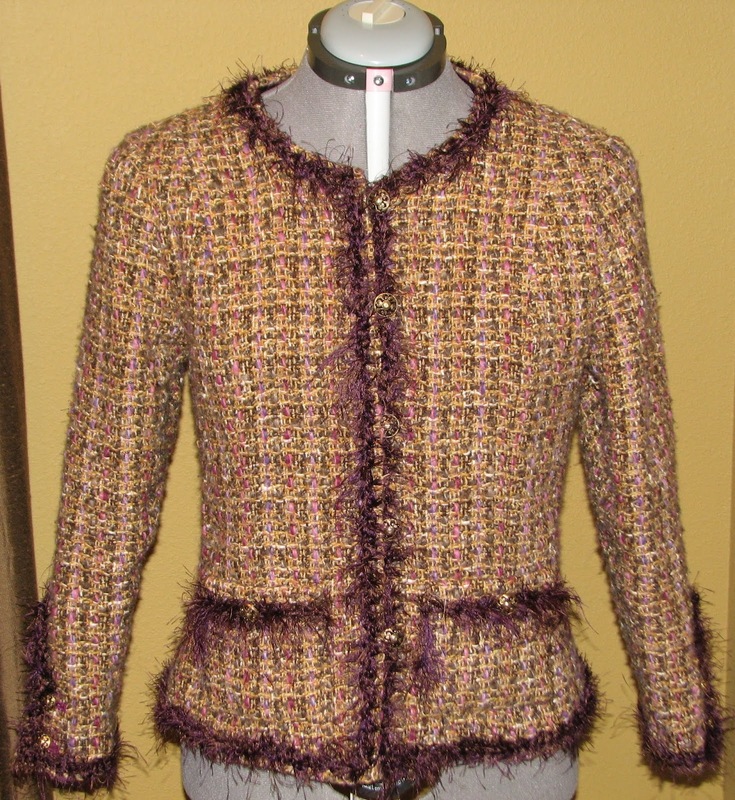 Have I mentioned that my "Chanel" jacket is finished? Even though I have worn it already, I put it back on the dress form, so that everyone I can admire it while sewing my pants. Because so much thought/torment/learning went into this piece, I feel I must document the information somewhere. This is the least likely place for me to lose said documentation. (1) Buttonholes down the front. For reasons I don't recall, I did not design the jacket to button down the front. Maybe I wanted hooks. Maybe I wanted it to just hang open. At some point -- after the pieces were cut -- I did decide I needed buttons. Since I didn't have enough room for overlap, I made loops. Although the loops came out very nice, and are very stable (sandwiched between two strips of muslin that run the length of the front), I am a little disappointed that I didn't have a more traditional placket. 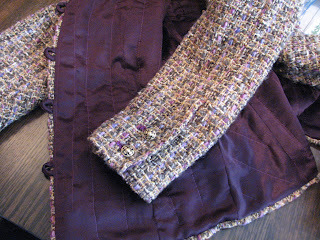 (2) Boucle: I love the colors in this fabric, even though it's not my usual palette. This fabric is tres boucle, though. The chenille pieces stretch, break and pop out in several places, making it look as though I may have picked up the jacket in a second-hand shop [not that there's anything wrong with that]. I would choose a tighter weave next time around. I also sneezed a lot while sewing this. I hope I'm not allergic to it. (3) Lining: The color of original fabric I ordered to use as a lining did just not look right to me, so I picked up some charmeuse locally. Unfortunately, it's not silk. For polyester, it's fairly high quality, but it's not silk. Next time I will use silk. (4) Pattern: When I started this jacket, the latest Claire Shaeffer pattern had not been released and her previous pattern was OOP, and in high demand. I could not justify paying $150 for a sewing pattern on ebay, so I decided to create my own. I had an old Simplicity used for a quilted jacket 10 years ago that had princess shoulder seams, but a one-piece sleeve and I had the Vogue pattern that had a two-piece sleeve, but was loose fitting and too boxy for me. So I combined the two of them and drafted a three-piece sleeve and a bodice with shoulder princess seams and a side piece cut on the bias. Since I had no experience doing this, it took me SEVERAL toiles before I had something that looked decent. I know I must have learned an awful lot in the long drawn-out process. However, I'm not sure I remember what I learned, since I did not document anything. It's probably still rattling around inside my head helping me make fitting adjustments. I did purchase the V8808 a couple of weeks ago when Vogue had a sale. Next time I will probably use it. (5) Trim: I went through at least as many iterations of trim possibilities as I did muslins. Self trim, ribbon, gimp, braid and several types of crocheted trims with several different colors of yarn, as well as combinations of most of the above together. I finally settled on eyelash yarn (one strand of purple, one of brown), crocheted into a simple chain with a large hook. 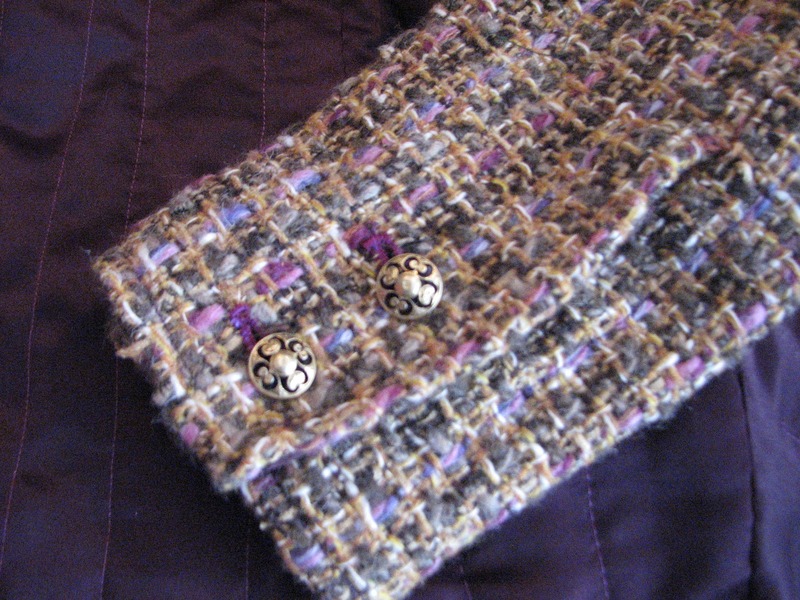 I feel that it balances the large weave of the boucle. I don't think it would have looked the same on a tighter weave. So I do feel it worked in this case, but will probably torment myself again next time. (6) Sleeve vents: As mentioned, the sleeves were self-drafted, and I've never drafted a sleeve or sewn a jacket with vents, so it was a crash course in vents. They came out fine, but I spent an awful lot of time on them. I could have easily skipped the buttonholes and just sewed the ends together -- which I considered many times -- but felt like I needed to have real buttonholes somewhere on the jacket. They were a lot of fun to make and am looking forward to my next opportunity to do a hand-worked buttonhole. Next time I would put a larger piece of organza into the end of the sleeve to help stabilize the buttonholes. I don't remember why they were only 2" wide. Next time I will cut the organza 4" wide. 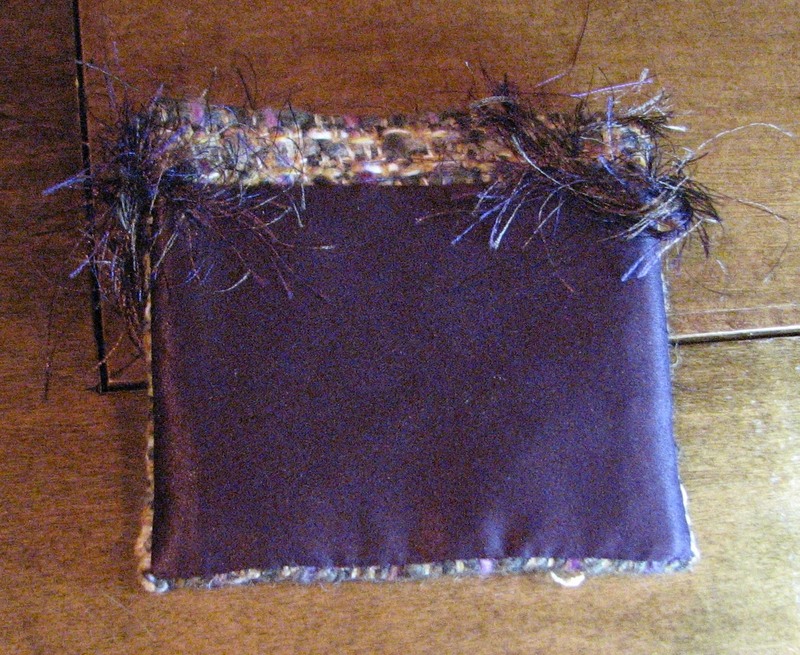 (7) Pockets: I made 2 patch pockets, but considered doing three or four. I just couldn't find a combination that I was happy with to extend the number of pockets. The pocket is lined with lining fabric and interlined with organza to give it some stiffness. I think they came out nicely - I would revisit the 3 or 4 pocket options, though. (8) Buttons: One area where I agonized excessively...finding the PERFECT button. This part of my planning went on for weeks. Really. 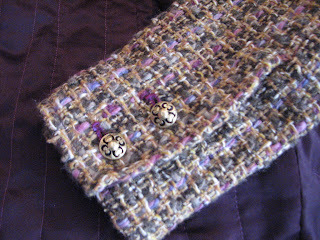 I finally settled on some simple gold buttons from Joann. They are fine -- classic and simple. 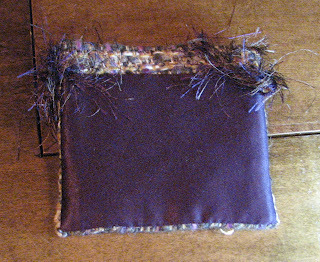 As with the trim, future buttons will just depend on the fabric I use "next time." All that being said, I don't really know if I will ever have the time to do a jacket like this again! I did learn a lot of new techniques that I will no doubt use in other projects, though. Beautiful. Wear it with pride. Beautiful jacket. You help inspire me to take the first steps onto the path - have just ordered some Linton tweed so am trying to learn from others. Enjoy wearing - and admiring - your hard earned prize! Have a great time, and take your time, with your jacket. Thanks for the note, it's great to hear my journey can help you on your way! I really like your jacket, and find your feedback very interesting. I made one too, and made some of the same discoveries as you. I still wear it quite a lot, and I certainly learned many new techniques from the Claire Shaeffer instructions.